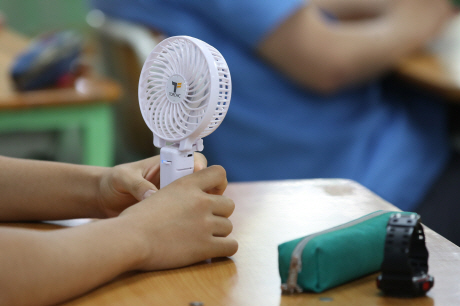 The Ministry of the Interior and Safety has issued a safety warning over the use of mini electric fans, a popular item in Korea during summer. “People often overlook safety when using portable fans that are small and convenient,” a senior official at the Safety Ministry said in a statement Friday, urging people to be careful. Between 2015 and 2018, a total of 40 accidents involving mini fans were reported, data from the Korea Consumer Agency’s Consumer Injury Surveillance System revealed. Two accidents were reported in 2014 before the number grew to 33 cases last year, though only one accident involving a mini fan has taken place so far this year. Accidents involving an explosion, overheating and smoke accounted for half of all the accidents, while two cases saw fingers get either stuck or squashed. The ministry advises against using mini fans for long hours and also high-speed chargers, and recommends people to opt for products made with softer materials. According to the ministry, sales of portable fans are on the rise. Mini fans accounted for 26 percent of all fans sold in 2015 in South Korea but they surpassed regular fans in sales for the first time last year.